1. 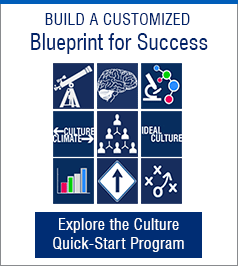 Begin With a Strong Foundation: a Thriving Workplace Culture. The executive leadership team is truly cohesive. The mission, vision and values are clearly articulated and every employee knows how she/he fits within them. Employees are empowered and enabled to leverage their strengths. Leaders and the work climate provide employees with autonomous support. Clear, timely and meaningful communication is provided for employees, and employees share feedback and ideas that are actually used. Clear, timely and meaningful feedback is provided for employees in the spirit of ongoing growth and development. The climate fosters innovation, creativity and meaningful work. Leaders truly value employees – and employees feel valued. People within the organization respect, support and care about one another as people, not just as employees there to complete certain job tasks. Accountability is embraced; the rules are clear and apply to everyone. Employees are provided the tools and resources they need to work safely and productively. Resources, programs, policies and the environment support employees’ ability to thrive in all areas of wellbeing. Employees are happy and proud to work there! First assess how well your organization is doing in these areas. Without a strong foundation, it will be impossible to create the conditions for sustainable change. Autonomy: The ability for employees to think and do for themselves. Mastery: The ability for employees to take advantage of opportunities to learn and grow, and become highly skilled. Purpose: The ability of employees to feel their work is meaningful and understand their connection to a greater purpose and vision. Creating these conditions has translated into great success for Zappos. Just 10 years after it began, the company was sold to Amazon for an estimated $1.2 billion. It is still known today for providing exceptional customer service and building customer loyalty, while consistently appearing in Fortune magazine’s “100 Best Companies to Work For” list. It’s human nature to fall back on deeply rooted habits, so trying to “do” differently without first thinking differently is doomed to fail. The nuances of human behavior communicate what we are thinking; therefore, change initiatives only work when we change the way we think. Organizations that recognize the importance of the cognitive process over the behavior itself will be able to foster meaningful change and improvements in the workplace. Practice Pausing. A person’s first thought usually stems from deeply rooted, habitual thinking. Pausing just a few seconds before acting creates space for greater self-awareness and making more thoughtful choices. If an employee comes to you with a problem, your first thought might be to answer in a way intended to fix it. Pausing in that moment will actually support your employee’s autonomy and mastery. After pausing, you might ask: “What solution would you recommend, based on your experience?” This not only takes the pressure off from you, but it also creates the conditions for your employee to grow and develop clarity of thinking. Recover from Perfectionism. When striving for perfection fails — and it always does — people get frustrated. Perfectionism is a key characteristic of a fixed mindset, which hinders people from success. Focusing less on an ideal result and instead embracing the journey will build resiliency and a growth mindset, which has been correlated with success! Recovering from perfectionism helps create the conditions for ongoing personal growth and development, and also sends the powerful message to others that they can let go of perfection. Organizations that focus on creating the conditions in which people can find their own motivation will reap the benefits of employees who are truly engaged at work. How are you creating the conditions in the workplace for employees to harness their own motivation? Tell us in the comments section below! 1. Deci, E. L. & Flaste, R. (1996). Why we do what we do: Understanding self-motivation. New York: Penguin Books. Jon is an accomplished teacher, speaker, writer and consultant. He has spent more than 25 years helping people with weight- and eating-related concerns and advocating for shifting health promotion away from its traditional, biomedical, control-oriented focus. Jon is a national leader in the Health At Every Size™movement and helped implement this unique alternative to weight loss programs at worksites in over 15 cities across the U.S. in the past 2 years.